As of today, Vertigo Comics’ ongoing comic book series “iZombie” begins day-and-date digital release on comiXology, starting with a new story arc and a new jumping on point for readers. Co-created and written by “Cinderella: Fables Are Forever” writer Chris Roberson and “Madman” artist Mike Allred with colors by Laura Allred, “iZombie” follows a zombie girl named Gwen and her friends, Ellie the ghost and Scott, a man who turns into a terrier during the full moon. Together the three solve mysteries in Eugene, Oregon, fulfilling the final wishes of the dead people whose brains Gwen must eat to stay alive. Nominated for a “Best New Series” Eisner earlier this year, “iZombie” goes digital starting with #19, which takes place in the aftermath of the Eugene zombie outbreak and offers revelations about how Gwen became a zombie in the first place. Roberson spoke with CBR News about his hopes for the digital release and his creator-owned series, as well as explaining how romance and armageddon go hand in hand in his next two story arcs. 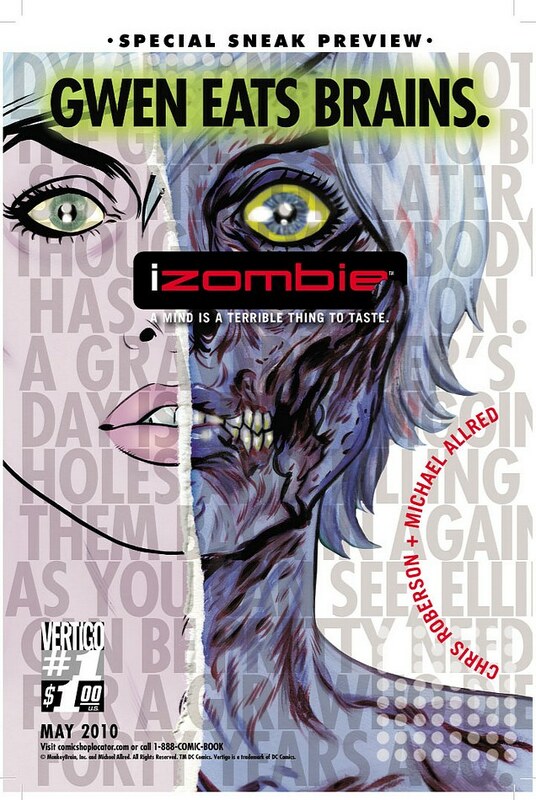 Roberson Takes “iZombie” Digital – Comic Book Resources.